We’ve made some pretty huge roman blinds in the past, but this one I think sets another record – in-house at least! When we first met our Buckinghamshire client during their house renovations, their 5 panel bi-fold doors posed the usual problem. Five panel doors are a bit of a tricky proposition. A two blind configuration cannot be split down the middle of the bi-fold recess as this would fall down the middle of a window panel. Typically we would suggest for windows of this span (over 4 metres) one blind sitting over three windows, and the second over the remaining two – usually where the single door opens, so the smaller blind can be easily raised for access into the garden. However our client didn’t like this aesthetic, and so we turned our hand to creating a bit of a monster – a roman blind 4.1 metres wide by 2.2 metres drop. A second blind above the kitchen sink was a mere 2.1metres wide! Two roman blinds sitting side by side in this new kitchen renovation. The left hand blind is over 4metres wide and had to be assembled on site. Whilst our workroom wasn’t fazed in principle making such a large lined and interlined blind, its dimensions created other challenges. Firstly the internal rods and bottom weight bar that strengthen the blind and give it its structure are not manufactured to such wide dimensions, and so we had to create joining screws in our workshop to screw the rods together thereby extending them to the required width. This also meant that the blind had to be assembled on site – namely the doweling rods and bottom weight bars had to be joined together on site, and also inserted into the blind and sewn in place – all by Moghul director and fitter of some of our trickier challenges – Charlie White. Each blind is operated by a chain driven headrail system, with a 1:4 gearing ratio to handle the weight of the blind. The end result (pictured above) was stunning. Client cleverly chose a fabric with a light fern pattern that draws inspiration from the garden outside, in soft sage green hues. 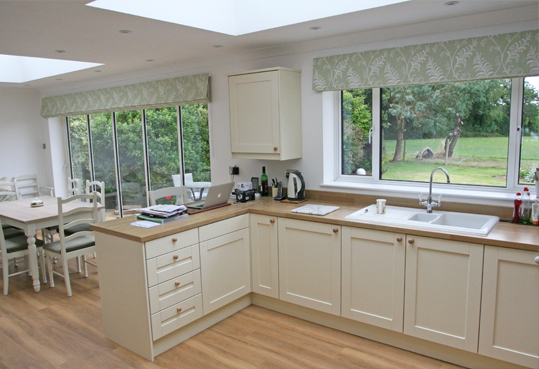 Rather than dominating the room, the blinds blended in seemlessly, complimenting the existing decor of the kitchen.